Several sleep disorders affect the elderly. 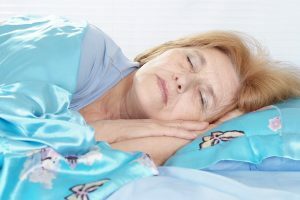 Whether difficulty in falling asleep, staying asleep, or falling into a deep sleep, these common disorders can affect seniors more than any other age group. In addition to being more prevalent, their effects are more severe and can lead to mental confusion, irritation, and increased susceptibility to falls and injuries. Insomnia is difficulty going to sleep, staying asleep, going back to sleep upon waking in the middle of the night, or a fitful night’s sleep. Restless leg syndrome is a disease characterized by an uncomfortable feeling in the legs that can only be relieved with movement. It generally occurs at night when lying down. Rapid Eye Movement (REM) sleep behavior disorder occurs when a person acts out their dreams which are often intense and violent. One study suggested a link to Parkinson’s when 38 percent of patients with REM sleep behavior disorder developed Parkinson’s 12 to 13 years later. The elderly are commonly affected with sleep disorders for several reasons. These include taking medications with this as a potential side effect, certain diseases such as forms of dementia and heart disease, and chronic pain as it occurs in osteoarthritis. Dietary changes include limiting beverages to one hour before bedtime, avoiding alcohol intake, limiting caffeine to six hours before bedtime, ideally quitting smoking or, at the very least, limiting it to a few hours before bedtime. Behavioral changes include avoiding taking a nap, exercising no less than four hours before bedtime, creating a peaceful environment by taking a warm bath, reading a book, turning off the TV, and enjoying a light snack before bed such as a banana or yogurt. Maintain a sleep routine by going to bed and arising at the same time each day. Should your loved one need assistance with integrating these changes into their lifestyle, consider the aid of an elder care provider. These caring professionals can help prepare healthy meals and ensure both beverage and meal times are adhered to. They can provide a relaxing atmosphere at bed time, help with bathing, and make certain the new sleep schedule is maintained. If you or an aging loved one are considering elder care in Matawan NJ, please contact the caring staff at Lares Home Care 888-492-3538 or 732-566-1112.